On paper, presidential hopeful Bernie Sanders is widely considered an independent politician, despite running as a Democratic candidate. 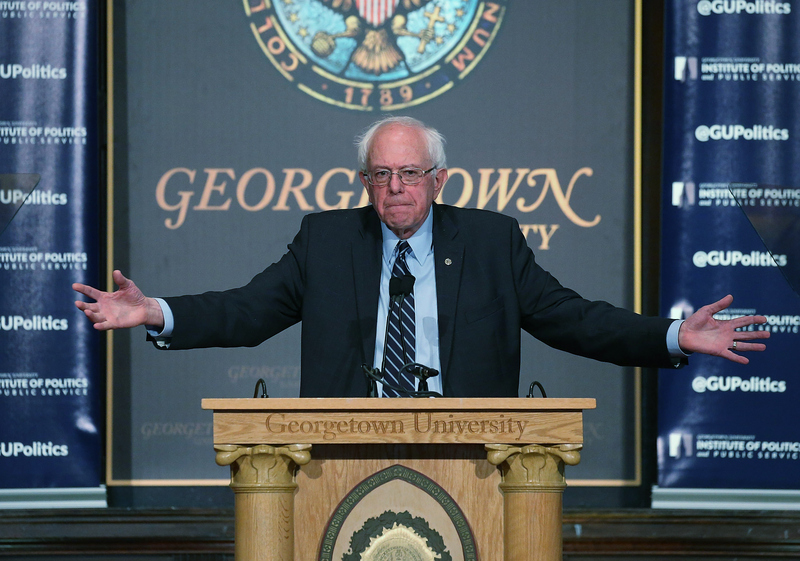 Prior to formally entering politics, Sanders was a prominent activist heavily involved in the socialist movement; that ideology has greatly shaped his views, something he explicitly highlighted in a speech delivered at Georgetown University on Thursday. The many Bernie Sanders quotes about democratic socialism from his remarks provide better insight on Sanders' views as well as his own political inspiration. The Vermont senator quoted President Franklin D. Roosevelt at length to kick off his speech, describing Roosevelt's assessment of how the Great Depression had ravaged the country. Though somber in tone, Roosevelt provided millions with hope and a better chance at economic equality thanks to policies implemented that are still in place today, such as Social Security and the advent of a minimum wage. Sanders referenced the establishing of Medicare and Medicaid as similarly important moments that prove the benefits of democratic socialism. Perhaps the biggest takeaway from the candidate's impassioned speech is the fact that there has already been a precedent for his political views. Sanders used past examples, current statistics, and his consistent voting record to highlight his views. He ended his speech detailing the ways in which he'd combat ISIS, which would involve more collaborative efforts with other countries. Social Security, which transformed life for the elderly in this country was "socialist." The concept of the "minimum wage" was seen as a radical intrusion into the marketplace and was described as "socialist." Unemployment insurance, abolishing child labor, the 40-hour work week, collective bargaining, strong banking regulations, deposit insurance, and job programs that put millions of people to work were all described, in one way or another, as "socialist." Nearly 47 million Americans are living in poverty and over 20 percent of our children, including 36 percent of African American children, are living in poverty ... 29 million Americans have no health insurance and even more are underinsured with outrageously high co-payments and deductibles. ... Youth unemployment and underemployment is over 35 percent. Meanwhile, we have more people in jail than any other country and countless lives are being destroyed as we spend $80 billion a year locking up fellow Americans. It's time we had democratic socialism for working families ... It means that we should not be providing welfare for corporations, huge tax breaks for the very rich, or trade policies which boost corporate profits as workers lose their jobs. It means that we create a government that works for all of us, not just powerful special interests. It means that economic rights must be an essential part of what America stands for. Health care should be a right of all people, not a privilege... The Affordable Care Act, which I helped write and voted for, is a step forward for this country. But we must build on it and go further. Medicare for all would not only guarantee health care for all people, not only save middle class families and our entire nation significant sums of money, it would radically improve the lives of all Americans and bring about significant improvements in our economy. Democratic socialism means that, in the year 2015, a college degree is equivalent to what a high school degree was 50 years ago — and that public education must allow every person in this country, who has the ability, the qualifications and the desire, the right to go to a public colleges or university tuition free. Democratic socialism means that our government does everything it can to create a full employment economy... That we must raise the minimum wage to a living wage — $15 an hour over the next few years. The next time you hear me attacked as a socialist, remember this: I don't believe government should own the means of production, but I do believe that the middle class and the working families who produce the wealth of America deserve a fair deal ... I don't believe in special treatment for the top 1 percent, but I do believe in equal treatment for African-Americans who are right to proclaim the moral principle that Black Lives Matter. I'm not running for president because it's my turn, but because it's the turn of all of us to live in a nation of hope and opportunity not for some, not for the few, but for all... I'm not running to pursue reckless adventures abroad, but to rebuild America's strength at home. I will never hesitate to defend this nation, but I will never send our sons and daughters to war under false pretense or pretenses or into dubious battles with no end in sight.